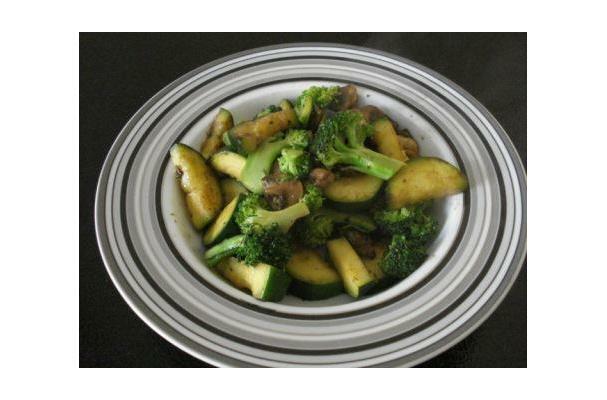 PREPARATION: Wash, pad dry and cut zucchini, mushrooms and broccoli into small to medium slices. Peel and grate ginger, garlic very finely and cut the onion into small chunks. COOKING: In a skillet heat oil on medium high heat. Once oil is hot add ginger, garlic and onion and sauté for few minutes . Once the ingredients are slightly golden add the broccoli and mushrooms and stir well and cook for few minutes. At this point in time add the zucchini, salt and pepper and stir well .Cook for another few minutes and take off heat and serve. This dish needs to be eaten right away because once cold it loses its originality. We usually have it with rice, pasta or with roast meats or seafood. Eating healthy is something that Quissy and I try and follow in our everyday diet. Vegetables are very good for you and good for the body. Honouring our body which keeps us healthy and keeps us going in our daily walks of life by honouring it with healthy food is very special. We sometimes forget to do that and stray away from these healthy habits. Today we decided to have a nice medley of fresh vegetables as our main dish. This dish just exuberates healthy from the get go. Zucchini, broccoli, mushroom sautéed in olive oil with onion and fresh ginger and garlic with a touch of salt and pepper. MMM nothing can take away the freshness and beauty of this dish. All needs to be done now is to enjoy the nice flavours and savour it.